Lenses are everywhere, in mobile phones, security cameras, projectors, medical equipment and lighting, as well as in more specialised optical equipment such as microscopes, with each application creating its own unique demands on cost, size and ease of operation. This new technology, developed by Emily Triggs and Jerome Charmet, provides a simple, quick and low-cost manufacturing method for tuneable liquid lenses. The uniqueness of this manufacturing technique lies in is simplicity and speed, resulting in lenses which are highly resistant to difficult environments and are expected to be low in optical aberrations. 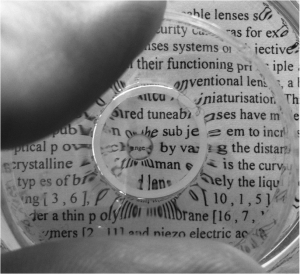 Even at lab scale the lens can be manufactured in less than an hour. 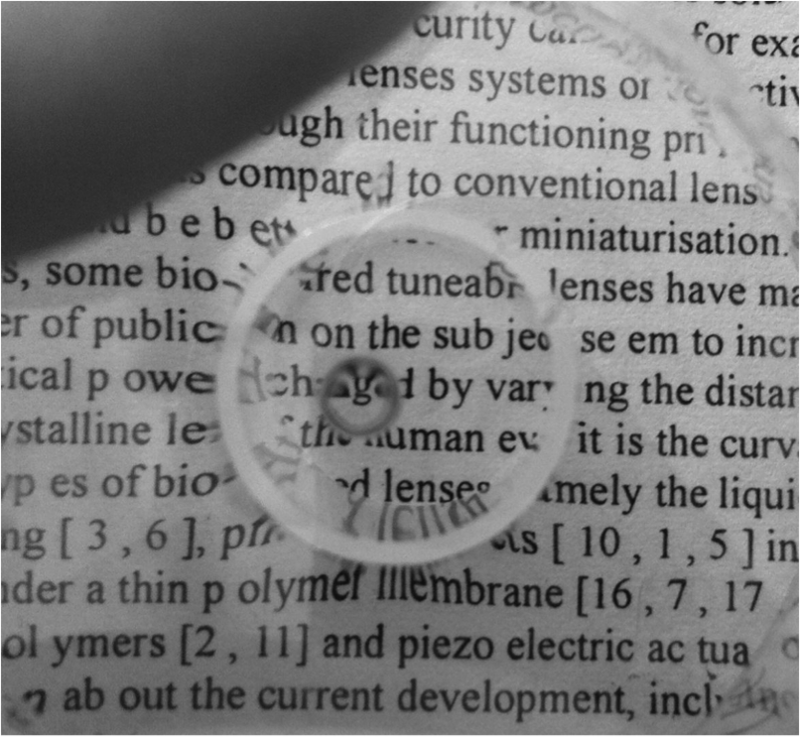 Different sizes of lenses can easily be manufactured, and the properties can be varied by using different liquids inside the lens. 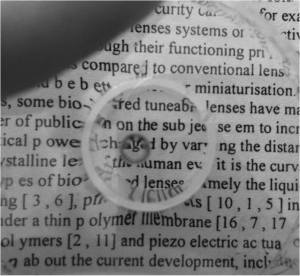 Current industrial techniques create lenses which are much more complex and costly to manufacture. By contrast this lens could be very cheap to manufacture in high volume. The structure of the lens allows the magnification (focal length) to be altered by a simple mechanism which can be implemented without complex electronics or any moving parts, and without any secondary lenses. Changes to the focal length are almost instantaneous. In addition, the polymer used is a very stable substance, resistant to many chemicals, suggesting that the lenses may prove to be of value in challenging environments where other optical systems do not work well. Moreover, it will provide a good resistance to vibration. The challenge for the i-Team is to investigate the widest possible range of uses for a new lens and identify those applications that most benefit from this new technology. There are two areas to consider, firstly by looking at the technology as a new means of manufacturing low-cost and robust lenses, and secondly by looking at it as a way of creating easily-tuneable lenses.